Yes, indeed. Everyone knows how difficult it is to get everyone together for a family photo. That even holds true for our monastic family! We did our best but are still missing a few wonderful faces. We love them and apologize that they are not in this picture. 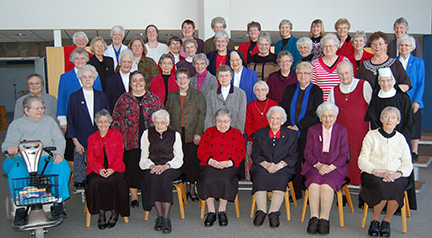 Not pictured are: Sisters Margaret Nelson, Helen Kilzer, Mary Walker, Madonna Wagendorf and Agnes Reinert. We missed you!